I am Prachi Y. Rajwade. 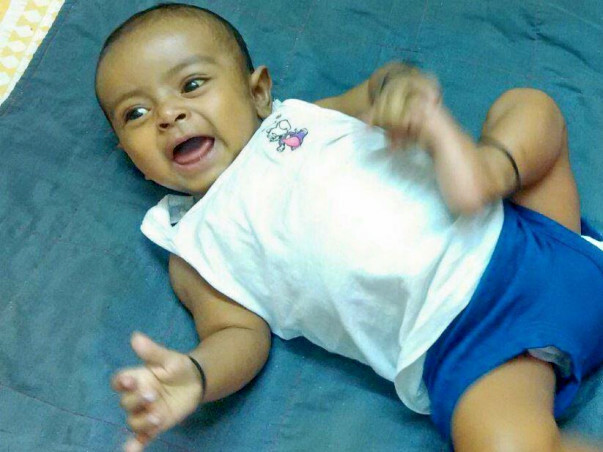 My 7-month-old son Parth is fighting with chronic liver disease called Liver Cirrhosis caused due to biliary atresia. He has undergone a surgery (Kasai Procedure) at the age of 2.5 months, but unfortunately surgery did not help and was termed a failure. 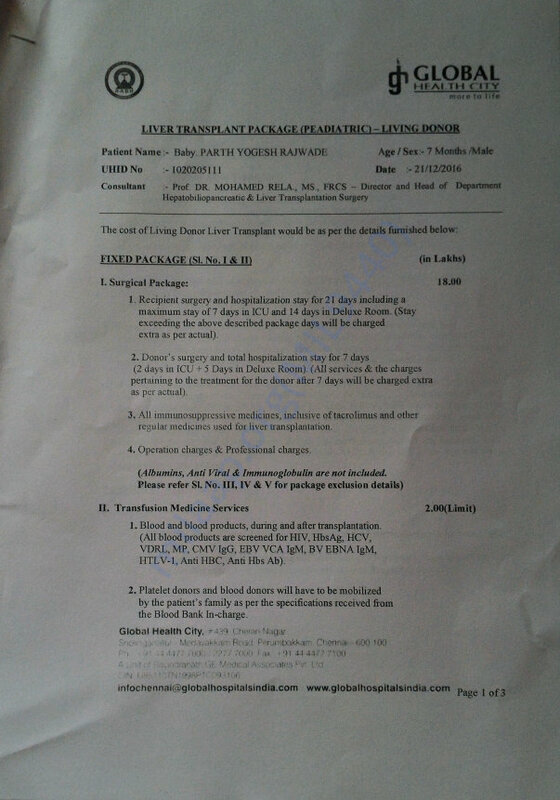 Parth is a young fighter with a strong will power but his liver now needs a transplant as early as possible. Parth was born in 8th month of pregnancy. Even being a pre-mature, he seemed to be healthy at the time of birth with 2.9 kg of weight. One month later, we observed that his eyes were yellow and were showing symptoms of jaundice. Soon he was diagnosed with rare liver condition called biliary atresia. Doctors then suggested a surgery called Kasai procedure. 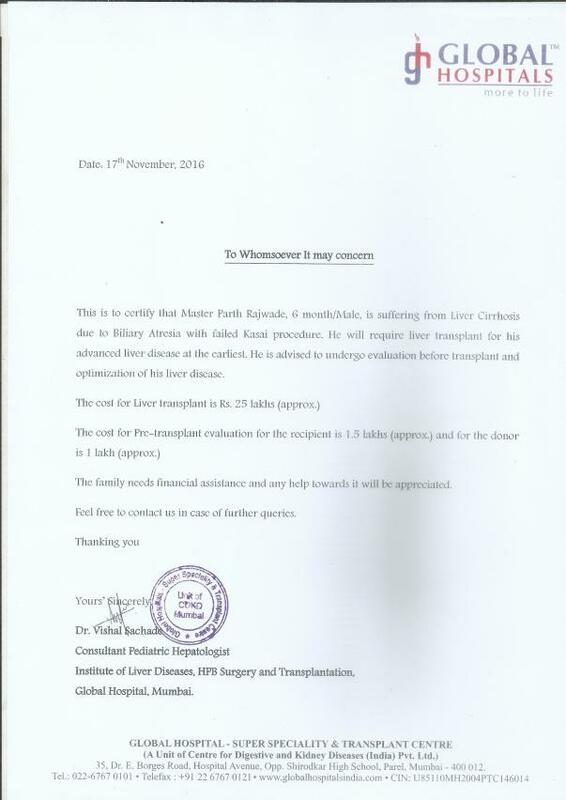 But unfortunately, four months after surgery doctors observed that the operation did not help, so Parth needs to undergo liver transplant. 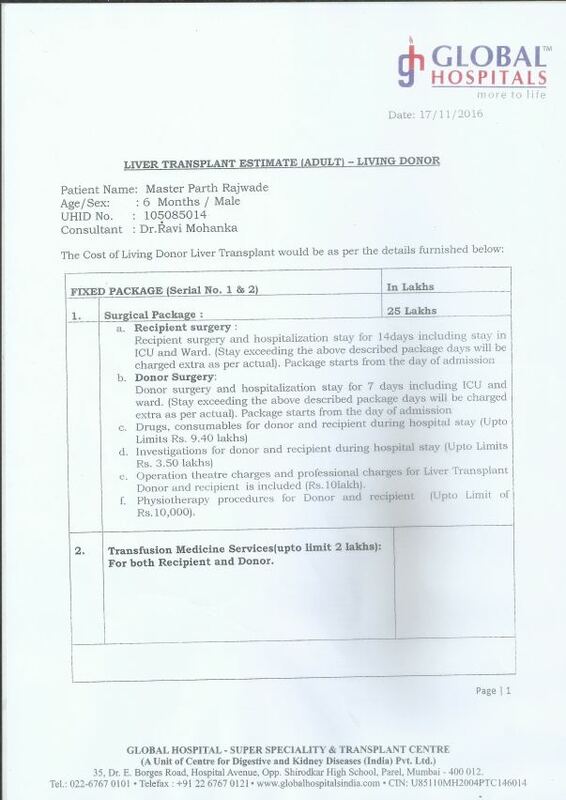 He is at home in Dombivli and having treatment in Global Hospitals, Mumbai (Liver OPD). His UHID No. is: 105085014. 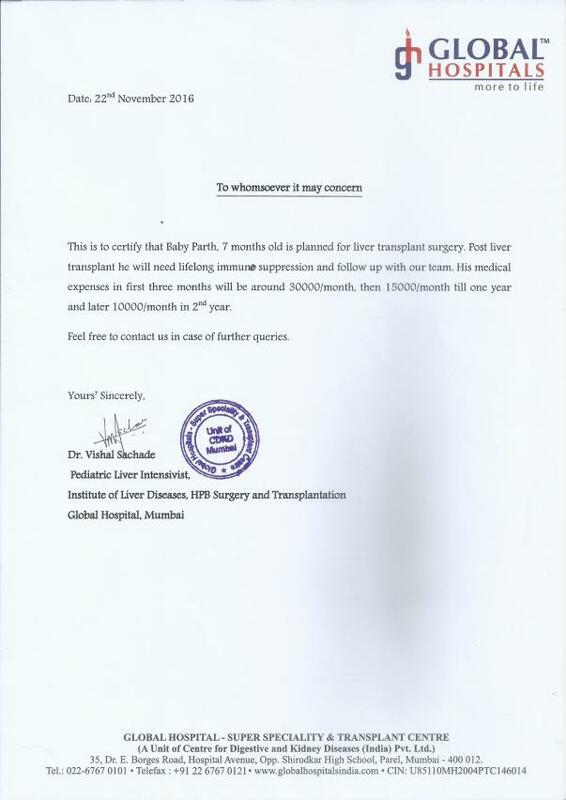 Post Liver Transplant he will need lifelong immune suppression and follow up with Global Hospital Mumbai Team. 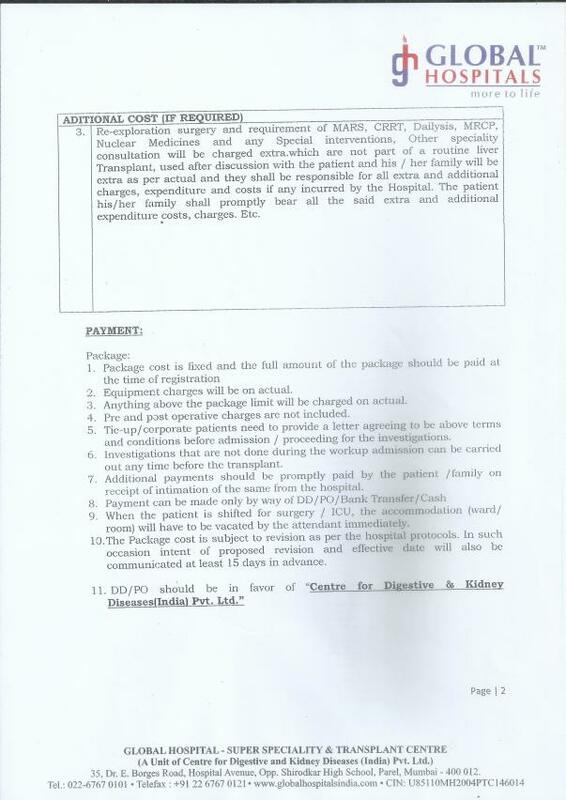 His Medical expenses in first three months will be 30,000/month, then 15,000/month till one year and later 10,000/month in 2nd year. 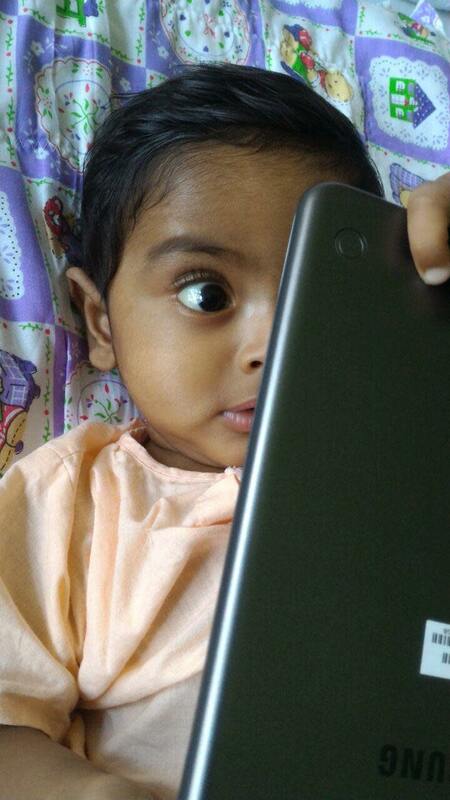 Parth has been bravely battling his life-threatening liver ailment. We now need your support. 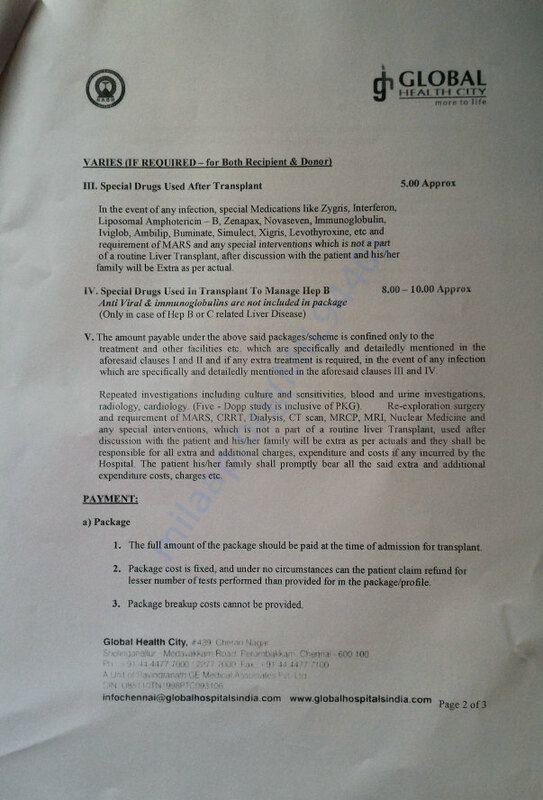 The target has been set to cover, transplant and post-transplant care for 2 years including medications. A small contribution can go a long way to help Master Parth to survive and have a healthy life. After a long and long waiting period, finally Chennai Global have decided to discharge us and we will be soon going back home with our cute, naughty and mastikhor Parth. 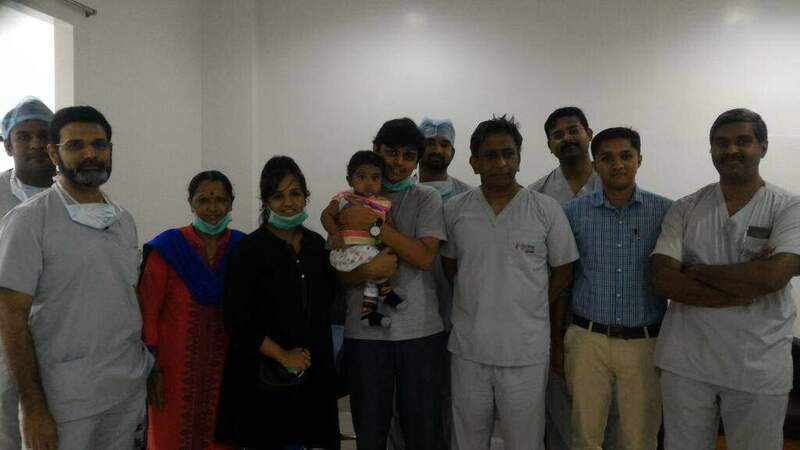 Today, Parth had his final meeting with surgeons, paediatricians, and dietician. 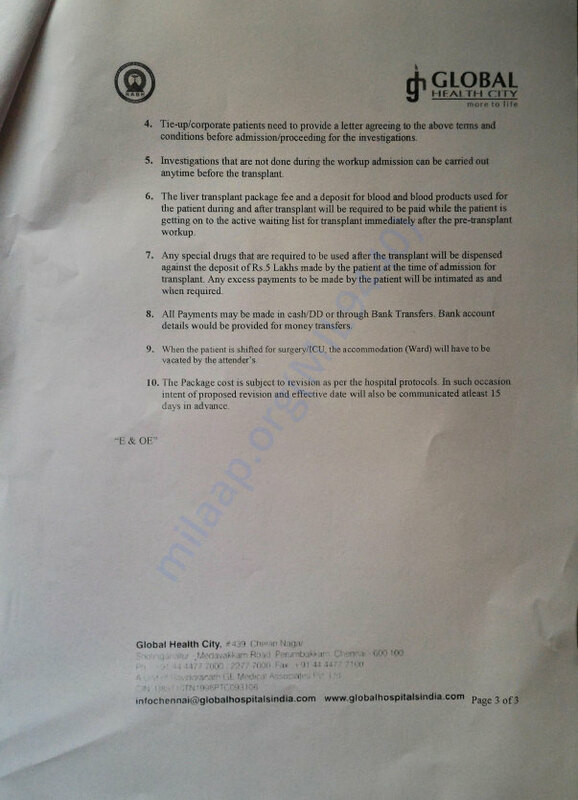 They said we can take further treatment in Global hospitals, Mumbai and reports can be sent to Chennai for review, also will have to follow up with Global Hospitals, Chennai after six months. Rushing home to pack our bags. At the end, I would like to thank and salute each and every person who had helped us in whichever way possible to save our son from this critical situation. This example will surely make everyone believe that Humanity still exists. He is not having fever now. Yesterday and today, they did few more tests, CT scans, doppler etc. I will update you all with the reports soon. Doctors are saying that as it's a major surgery, some side effects are part and parcel of surgery. Sorry once again for late update but it's being bit difficult to handle him and to post the updates timely. Please keep praying for Parth. Parth is doing well now, reports are stable. His counts are gradually coming down. His skin is still bit yellowish but eyes are 80% clear now, started taking feeds. Many tubes have been removed. Only few medicines are through IV. Stitches are healing slowly. He is active and naughty as he was before. Very happy to see him like this.